Zucchini is one of those vegetables that you can prepare in several ways. At home I make stew, I stuff it, bake it, I make cakes and bread or soup out from zucchini. As you see, the variety of dishes that can be prepared from it is really wide. Today I made rings covered in breadcrumbs, fried in oil and served with some delicious cheese and garlic sauce. Served in this form this vegetable can be a main dish, an addition or a snack. 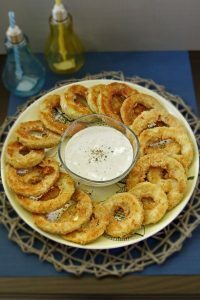 How to prepare zucchini rings. Peel the zucchini and cut it into one-inch thick rings. Remove the seeds from the middle. 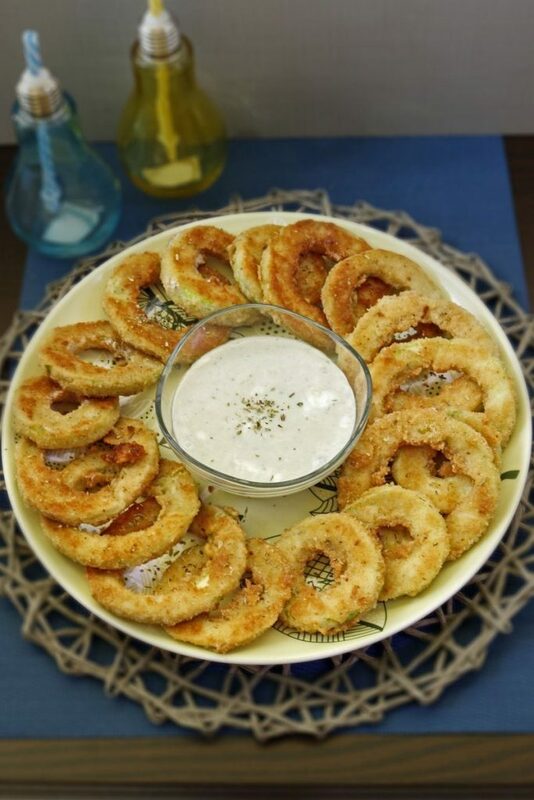 Cover each ring with salt and pepper. Put them aside for 2 minutes. Afterwards, roll them in flour, then in beaten eggs and in bread crumbs. Fry until golden brown. Sauce: mix grated cheddar cheese with crushed Stilton cheese and add minced garlic to them. Melt the mixture in the microwave. Afterwards, add mayonnaise and mix thoroughly. Serve with the warm rings. What You need to know when making fried zucchini. When removing the fried rings from the hot oil, put them on a kitchen towel to let them dry. You can prepare other vegetables, such as cauliflower or broccoli, in the same way.